Food waste is a growing problem throughout the world; on one hand, we’ve got so many people starving or living in food insecurity, and on the other hand, in places like Western Europe or the US people are wasting almost 50% of what they eat. It seems rational to find ways to send the excess food to the places where it’s most needed, but that doesn’t happen nearly as much as it should. With that in mind, people in Galdakao, Spain, took initiative. 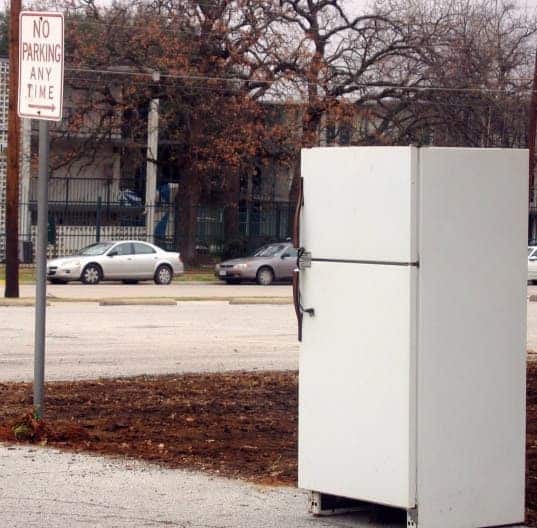 They launched what they call the Community Fridge – a regular white fridge placed in the middle of the town where anyone can drop food or leftovers and anyone can come in and take it. This one fridge has already saved 300 kg or about 661 pounds of food in just two months. The creators of the fridge are adamant that the service is not a charity – anyone can come and just take whatever food they want. Of course, there are a few regulations though – you can’t donate raw fish, meat or eggs, for health reasons. Also, all the food has to be within its expiration date and anything homemade should have a label with the ingredients; reasonable rules, and so far, the program seems to enjoy its success. Other Spanish cities have expressed interest in adopting their own Community Fridge. This is not the first time this kind of idea has been put forth. In Pumpipumpe in Switzerland residents place stickers on their mailbox to mark goods they can lend to neighbors and that works out just fine. A man in the Saudi city of Hail has also put a fridge outside his house and called on neighbours to fill it with food for the needy. However, in Yolo County, California, several University of California graduate students placed a community fridge on their lawn, sharing what they didn’t need. People loved the idea and it worked just as it should, until the Yolo County Health Department caught wind of the experiment, they shut it down. County officials claimed the fridge was an illegal food facility. “He’s started a food business. The food’s not from an approved source. He can’t guarantee its safety. There are so many unknowns that there is a high risk to the public,” said April Meneghetti, a Yolo County environmental health specialist. That idea doesn’t fly in the US, and it seems like some people would rather throw food away than risk sharing it with others, but I certainly think this idea is worth spreading. Sure, you need someone to actually verify the contents of the fridge periodically and take out the food that goes bad, but for 150 kg of food per month, with one fridge? I think that’s worth it.